Installation of the F-111 mural scaled painting. I love you with my Ford. The Solomon R. Guggenheim Museum is arguably one of the most demanding, daunting and complex spaces in which to view works of contemporary art. It is the cruel anvil on which many an art star has been hammered into submission. Rarely has an artist triumphed over the demands of that corkscrew space. It is a great relief at several levels, the result of a much later expansion and renovation that one may slide off the ramp into some semblance of normalcy in white cube galleries of a more conventional configuration. A singular exhibition that reformed those obstacles into a resonating positive was the brilliant Robert Wilson installation of Armani fashions. All too often, as a result of the rigors of the space, and its inflexible insistence that we proceed according to its dictates, we have emerged thinking less not more of the artist or theme in question. The horrors of the Frank Lloyd Wright design (1957-1959) demand that we look at art his way. Now and forever. It entirely negates the possibility of a private meander. I prefer to view exhibitions while darting back and forth, dwelling here, rushing ahead, threading back. Not, as is the case in the New York based monument to Wright’s eccentric ego, being pushed like ground meat through a casing of art sausage. Accordingly, I rebel. For example, I always tour the Guggenheim Museum from the top down in reverse order of the installation by taking the elevator to the top level. Actually, you have to climb up a bit to start at the end. Then titubate down through the exhibition which I find more pleasant than slogging my way uphill. In the case of viewing the current exhibition, “James Rosenquist: A Retrospective,” through January 25, 2004, this had an unexpected benefit. It clearly emphasized that through a long and productive career, that started in the 1960s, the artist is now doing his very best work. The paintings of the past few years have never been richer or more brilliant in color, mastery of the brush, flickering trompe l’oeil trickery, fracture and layering of space, as well as, an intensity of pop culture iconography. These often epic-scaled murals, including several in those white cube, sidebar galleries, were just brilliant and stunning. If he is not among the elite of greatest artists of our time, a difficult and complex debate, he is surely on the short list of greatest living painters. The slow, descending spiral through the nine circles of his career all too clearly reveal the bumps in the road, setbacks and fallow periods, triumphs and pitfalls of his private hell, and Faustian pact with greatness. Every major artist pays a price. There were glimpses of this when I was an apprentice to the sorcerer. I knew of him, his work, before I knew him. My first glimpse came when Sam Hunter, the founding director of the Rose Art Museum of Brandeis University, during my senior year, in 1963, acquired, “Two 1959 People,” as part of the prescient Gevirtz-Mnuchin Purchase Fund. It was an endowment of some 23 works for the then new museum. A couple of years ago, there was an anniversary of that museum when I had lunch with Sam and current director, Joe Ketner. At the gala opening of the Graham Gund designed Rose expansion it was great fun hooking up with Jim after all these years. That painting, which combined two faces, a slice of bread, a cartoon of a section of a row boat drawn in black line on red, a license plate with the number 0-0000 dated 1959 (no state), some wall paper design applied with a roller, and a fishing pole with line attached to the top edge, has held its own and accrued greatly in value. It was the fishing pole that got to me as an undergraduate. Over time, I have grown far less rigid about contemporary art. 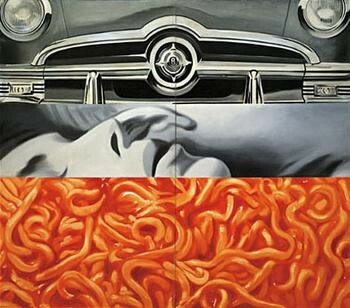 Before we met, I wrote about another important work by Rosenquist for Arts Magazine. I was living in New York at the time but returned to Boston and viewed an important exhibition organized by Sue Thurman for the Institute of Contemporary Art. It was an ambitious project in which she rented the venerable Horticulture Hall to install the American selection from the World’s Fair in Montreal in 1967. 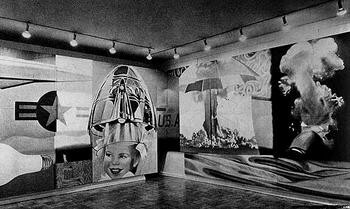 In that huge Buckminster Fuller dome, Rosenquist had created an enormous vertical, “Fire Slide,” which created the notion that some giant was descending from heaven into that space. During an Andy Warhol opening, I recall it was the silver pillows and cow wallpaper exhibition at Leo Castelli Gallery, my friend, Jim Jacobs, a Castelli employee, introduced me to Jim, who was wearing his famous paper suit, and asked if I would be interested in working for him. Having washed out of the graduate program of the Institute of Fine Arts at NYU, and abandoning hope of a career in Egyptology, I was desperate for employment. During the months that followed, in 1967, until I got a full-time job as director of Spectrum Gallery, a coop on 57th Street, I worked part time in Jim’s Broome Street studio, and helped build a stockade fence around his then being renovated home and studio in East Hampton. The experience was more and less than I expected. Jim would work feverishly, night and day for a stretch of time, and then call me and a couple of other guys to come and clean up the studio. Nobody was ever around when he actually painted. But now and then there were multiple projects we worked on. One time, for example, he taught us how to make light socket attachments for some “chandeliers” he was mass-producing. Another time, a gang of us made stripe paintings for some medals he was going to display on a float in an anti war parade and demonstration. They all got destroyed. There were long drives to East Hampton and time after work when Jim would feed the men, mostly burgers, and pass out tin cups for our daily ration of grog. The other guys would nod off while I tried to engage Jim about his art. It was tricky. Mostly he preferred to be the foreman or boss of the crew and we were the men. The workers. Jim tended not to wax philosophical. Which is why I split my side laughing at the stupid pretentious art speak in the lengthy, pompous wall label at the Guggenheim next to his most famous piece, “F-111.” It attributed to the artist all kinds of absurd notions. Jim may indeed have had some of those thoughts in his head, deep down, real deep down, but he never talked that way. He preferred to speak of himself as a kind of art worker. A sign painter and straight kid from the Mid-West somewhere. Who came to the Big Apple and got a gig painting those huge billboards in Times Square. Until guys feel off the scaffolding. He told me vividly of the day a friend died and the foreman watched him fall, paused, went into the trailer and punched out his time card. Jim quit after that and turned the techniques of a commercial sign painter into becoming one of the founding members of the Pop generation. It was a brilliant move. But Jim, a simple, down to earth guy, a worker, conveyed to me some of the wonder and confusion of being an art star. He was a pretty straight family man with a wife, Mary Lou, who I met only once, and a kid. But he would talk about being caught up in the glitter of the international art world and its sordid temptations which he staunchly resisted. But it clearly intrigued him. And, he seemed curious and attentive to this kid, a worker, who insisted on asking all those tough and probing questions. Behind that surface mask of the sign painter/ artist/ worker, Jim was really a profound thinker. He just covered it up pretty good. In the back seat of the car one time I found a journal of philosophy. So, I kindah outed him on that. I talked to him about psychedelic art, a term that had not yet been coined, and Eastern mysticism. He said that he had done some early Mandala paintings that I never saw. That job came to an end. I wasn’t a very good worker. And maybe I asked too many questions. But I have always loved the man and his work. It was one of the great experiences of my life to sit with him and sip Jack Daniels, or was it Jim Beam, yeah, probably Jim Beam, from tin cups after a day of hard labor. So a lot of that emotion and nostalgia rushed through my mind, heart and guts as Astrid and I made our way down the ramp of a life lived. In some ways it was my story as much as it was his. Like running into the barbed wire, tumble weed sculpture with neon. There was a stack of barbed wire that he had chrome plated in the studio. I helped him twist it into the mass that became the sculpture. But I thought it was funny when the chrome plating all fell off as he wrestled with it. Later we dragged it up to the roof and Jim lowered it down to ground level with a rope. I was and am afraid of height. As I said, I wasn’t a very good worker. One of the pleasures of this show was its inclusion of the small collages he made to work up the murals. Several of the studies for “F-111” were a revelation. I had always wondered how the smiling kid ended up under the huge hair drier. And it was interesting to see that work reconfigured just as it had been at Castelli Gallery. I looked carefully to see if it had aged any. It was wonderful once again to see the dolls wrapped in cellophane from a 1993 show at Castelli. That was a breakthrough that got him back on track from the dry period that preceded it when Rosenquist was making Rosenquists. At the lower level of the spiral, the actual beginning of the show, I was surprised at how flat and crudely painted were those seminal Pop works from the early 1960s. They were the works that established his reputation but, in hindsight, the surfaces seem dull and matte compared to the sumptuous flash of the recent decade. Yes, I understand what he was doing, conflating high and low culture, sure, but it now seems heavy-handed. But, even then, there were terrific moments like, “(Untitled) Joan Crawford Says…” (1964). That woman, “no wire hangers,” has always intrigued me as a wicked witch of Hollywood. And spaghetti which Jim always did great things with. Just like the ubiquitous enormous lipsticks in recent years. I missed not seeing the early, “Growth Plan,” one of his few straight pictures. By that I mean unaltered or not manipulated. Jim usually likes to mix and match so there are very few straight appropriations. He has a thing about postmodern cubism. Let me end with a disclaimer. To know the man is not to know the man. I know some things about the man but that’s about it. Nor do I know the work better than someone who never met the artist. Perhaps, in that sense, I know Michelangelo better than I know Rosenquist. Because I have studied his life and work intensively. But I never met Michelangelo. And, I know more about him. Perhaps some day I will get down to Florida and spend some time with Jim sipping whiskey from a tin cup. I have so many more questions today. But I am not sure that I would get more answers. Oh well.